From its historic ballpark at Wrigley Field to its long-lived professional association with the National League Central division, the Chicago Cubs have an ultra-passionate following in the Midwest's Windy City — and beyond! Celebrate your love for both the Cubbies and your family with this spectacular baseball gift that seamlessly combines these loves into a high-quality, customized MLB baseball wall art piece. 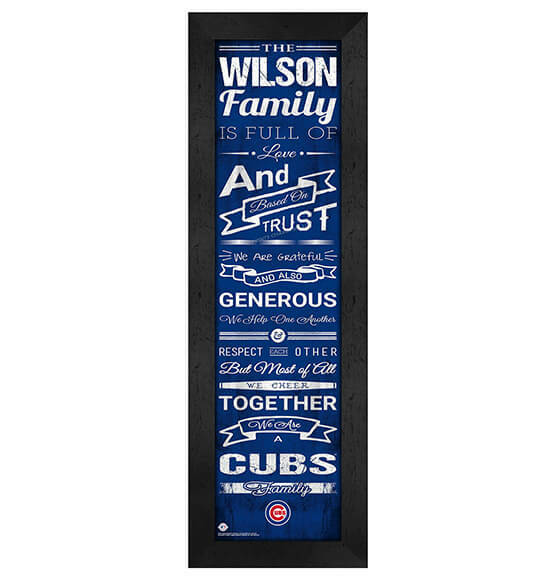 Our Personalized Family Cheer Chicago Cubs home decor features brilliant team colors and heartfelt phrases. Whether you give this Chicago Cubs sports decor as a gift or purchase it for yourself, this wall art is guaranteed to spark joy within the home for many years!